The networks are different and require a different wiring. They can connect two, three or thousands and more devices that can be located at the distance of several meters or unlimited distance. Twisted pair cabling is a form of wiring in which pairs of the wires are twisted together to cancel out the EMI (electromagnetic interference) from other wire pairs and external sources. There are three types of the Twisted pair cables: shielded, unshielded and foil. They are used for home and corporate Ethernet networks. In the Coaxial cables the transmission of the energy occurs through the dielectric inside the cable between the conductors. The electromagnetic wave is limited inside the cable, between the center conductor and the shield. The Coaxial cables are usually used for television. Optical fiber cable consists of the center glass core and several layers of the protective material around. It can transmit data on the long distances, but it is expensive. 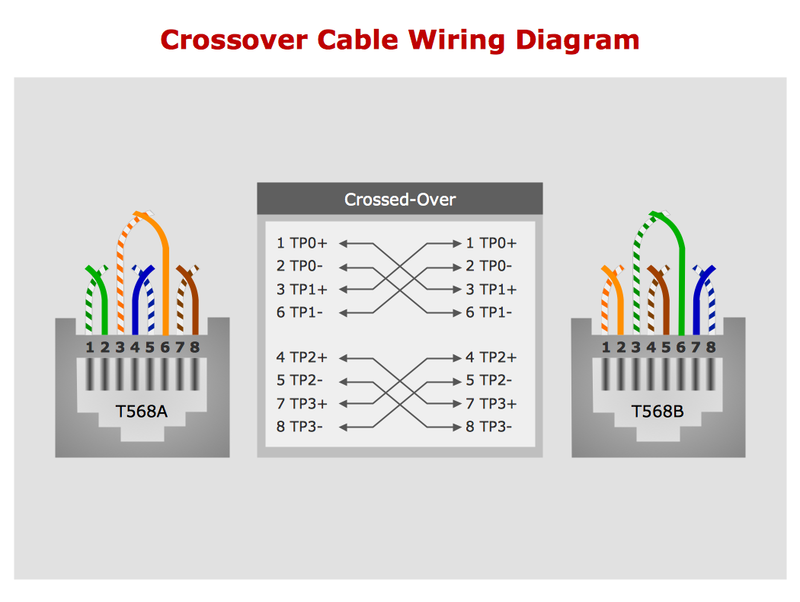 Crossover cable connects two devices of the same type. The crossing wires in a cable allow to connect directly - output of one to input of other, to connect hubs, switches, routers. Example 1. Network wiring cable. This example was created in ConceptDraw DIAGRAM using the Computer and Networks solution from the Computer and Networks area of ConceptDraw Solution Park. Using the solutions of the Computer and Networks Area for ConceptDraw DIAGRAM you can design your own computer network diagrams quick and easy. All networks are different and require a different wiring. They can be simple and consist of two computers connected with a network cable, or complex and consist of several computers, switches, hubs. This example was created in ConceptDraw DIAGRAM v12 using the Computer and Networks solution from the Computer and Networks area of ConceptDraw Solution Park and shows the Network wiring.